Analytics is basically data analysis focused on distilling information useful for improving processes and decision making, often in a business context. When applied to law firms, analytics can be used to improve client intake, increase the firm’s efficiency, and identify silos. How is this possible? How can simply collecting and analyzing data affect your law firm’s fees and revenue? In this episode of The Legal Toolkit, Jared Correia interviews data analytics specialists Patrick Fuller and Bill Sowinski about the analysis of current trends in the legal field, why and how a law firm should implement analytics, and the recommended technologies and processes for big and small law firms. Fuller discusses current trends in the Am Law 200, the Top 200 U.S.-based law firms ranked by revenue according to the American Lawyer magazine. He talks about how Am Law’s metrics are emblematic of the market and how this directly correlates to law firm revenues. Sowinski discusses why metrics and analytics are increasingly important for a law firm to be successful in the future. If used properly, analytics can become a differentiating factor for the firm and increase client intake. While big law firms can afford expensive technology and experts, Sowinski explains, small law firms can still use analytics by planning and implementing discipline to capture data. In the future of the legal field, Sowinski says, analytics won’t just be beneficial, they’ll be necessary. Patrick Fuller is Director of Corporate Solutions for Datacert|TyMetrix Legal Analytics. Patrick has made an art form of translating big data into intelligence for use in business development and organizational strategy. He has more than 17 years of experience in the legal profession. Bill Sowinski is the director of decision support services for Datacert|TyMetrix Legal Analytics. He works with clients to structure and analyze their legal data, facilitating the development and deployment of measured strategies and supporting policies designed to improve performance. Previously an insurance defense lawyer, Sowinski is a litigation expert and a pioneer in the legal analytics space. Jared Correia: Winter is coming, they say. Actually, Winter is already here, and here we are for another episode of the Legal Toolkit here on the Legal Talk Network. If you’re a returning listener, welcome back; and if you’re a first time listener, let’s make this a habit. I’m your host, Jared Correia and in addition to casting this pod, I’m also the assistant director and senior law practice advisor with the Massachusetts Law Office Management Assistance Program. LOMAP provides free and confidential law practice management consulting services to Massachusetts attorneys. For more information on LOMAP’s offerings, visit our website at massLOMAP.org. You can buy my book, Twitter in One Hour for Lawyers from the American Bar Association on iTunes, or on Amazon. My co-host, Heidi Alexander, is going to be back with you again next month. On the Legal Toolkit, we provide you each month with a new tool to add to your own legal toolkit so that your practices will become more and more like best practices. Analytics is a term you’ve probably heard. It’s basically data analysis which is focused on distilling information useful for improving processes and decision-making, often in a business context. To place this in a pop culture context, if you’ve read the book or seen the movie Moneyball, you probably know what I’m talking about. Today, we’re going to talk about the application of analytics in law firms; and we’re fortunate to have two guests on the program today. Patrick Fuller is our first guest and he’s the director of corporate solutions for Datacert|TyMetrix Legal Analytics. Patrick has made an artform of translating big data into intelligence for use of business development and organizational strategy. He has more than 17 years of experience in the legal profession. Prior to joining Datacert, Patrick served to the vice president of product and market strategy for Content Pilot. Before that, he was a senior consultant in the client gross strategy practice at LawVision Group, as well as being a consultant with Hildebrandt Consulting. He also served as a global managing director of the Monitor Suite competitive intelligence platform, which he helped launch for Thomson Reuters Hubbard One. Patrick’s a frequent speaker within the legal industry and he holds a BS degree in Kinesiology/Management from the College of The Ozarks. And by the way, Patrick, I love that area of the country; I’m in Southwest Missouri quite a bit. Bill Sowinski is the Director of Decision Support Services for Datacert|TyMetrix. In that capacity, he works with clients to structure and analyze their legal data, facilitating the development and deployment of measured strategies and supporting policies designed to improve performance. Bill has been with Datacert|TyMetrix for over a decade. Before that, he was Vice President of Litigation Management and Claim Legal Operations for the St. Paul Fire and Marine Insurance Company. He also served nine years as Assistant General Counsel of Owens-Corning Fiberglass. He began his career as an insurance defense trial lawyer before joining G.D. Searle & Co., a Fortune 500 pharmaceutical firm. Bill’s is a 1976 graduate of Marquette University Law School and who doesn’t love Milwaukee? Go bucks, right? So Patrick and Bill, welcome to the show. Bill Sowinski: Thank you for having us. Jared Correia: Glad to have you on, it’s our pleasure. So first off, gentlemen, I think we should start off by defining some terms. Patrick, your word is kinesiology. Did I pronounce it correctly and what does it mean? Patrick Fuller: Yeah, you did. It’s a very fancy way of saying the study of human movement. Particularly for me, I really got into the biomechanics related to sports. So that’s really where a lot of my focus was in college. Jared Correia: So you took a lot of golf etiquette classes is what you’re saying? Patrick Fuller: If you think of it in terms of baseball, I played baseball and one of the things we had to define hitting is the sequential unlocking of body parts to maximize that speed at the point of contact. So my thought was okay, how can I make those body parts unlock faster and with greater force and have a swing that has better velocity to increase the amount of force that’s applied to the balls. How can I make myself a better, more powerful hitter, and that got me into that field of study at college. Jared Correia: I peaked in Little League at age 8, but I was really good then. So Bill do you want to tell us some stories about Al Mcguire or should we hold off for later? Bill Sowinski: Actually I went to school with his son, Allie Mcguire. Went to high school and to college with Allie. Jared Correia: So you’re connected with the family. I didn’t even know that, I just threw that question out there. You’re at the McGuire family barbeque, right? So let’s get that out of the way, I feel better now. Now, as for you two, the pop quiz portion of this show is over, so there will be no more questions like that. However, I want to talk to you about law firm fees and revenue. What trends have you guys been tracking in those categories of recent vintage? Patrick Fuller: I’ll start off with this one here. We track a number of things, both individually and also collectively as an organizations company. Individually, one of the things that I have been tracking for a number of years and writing about, has to do with the Am Law 200. So the American lawyers ranks the top 200 U.S. based law firms by their total revenue. And there’s a lot of the metrics that are put in there such as the average revenue per lawyer, profits per equity partner, and leverage number of attorneys, partners versus associates, that sort of thing. And to me there’s a treasure trove of metrics in there that really are interesting and implematic of the rest of the market. They’re very reflective of the market. One of the things – and we could’ve alluded to this in the webinar that we did last year – related to building the analytical framework was looking at what the cause of this is. We see the impact as revenue; over the last couple of decades we’ve seen steady increases in the amount filings of the USPTO for example, and we’ve seen the M&A markets and their increase. And that has a direct correlation to the amount of revenue that’s being generated, especially with M&A, that’s such a feeder practice for a lot of big firms; creates a lot of work in various areas such as real estate and employment and that type of thing. So we’ve seen a lot of these increases manifest themselves in the Am Law 200. So the biggest thing, and I think there’s probably 2 big takeaways on this in terms of the Am Law revenue; and that is that over the last 10 years, we’ve seen the collective revenue of the Am Law 200. In fact, from 2003 to 2013, it increased 84%. So during that period it went from 49 billion to 92 billion in total revenue of all 200 firms. And that’s important because during that same period, the Fortune 500 only showed an increase of 72%. So you have the Am Law 200, that index, showing better revenue growth than the primary client base. You compare it to other areas, it was even more than the NBA revenue or the NFL revenue growth during the same period. But within that lies a bigger problem and that’s a lot of what we’ll end up talking about today is that what was the division of that revenue. It’s going up at breakneck pace, but what we’ve seen is the top 25%, the Am Law top 50. Ten years ago, they were getting roughly 52% of all that revenue. So it was a 52-48% split between the Am Law top 50 and the bottom 150. And as of last year, that had actually grown to 59% to 41%. So we’re really close to seeing a 60-40 split. And that has a lot of implications which we’ll talk about because you end up having a lot of that revenue shared at the very top of that which means that you have roughly 150 firms – or a segment – that’s made up of 150 firms that are getting a decreasing share of a rapidly increasing market which leads to a lot of complexity and brings in the focus the use of a lot of things related to analytics and metrics. Jared Correia: See, look at that, your kinesiology degree is coming in handy right now. Bill, do you have anything to add? Bill Sowinski: Patrick summarized that well. We’re helping our clients in focus, I work well with the corporate side. I work with corporations to help them identify those law firms that they want to retain for a particular work of business and help them identify which law firms do have some differentiative, which law firms do provide them some special benefits that they can’t get from other law firms and how this impacts – at least the clients I work with. It’s no longer just a beauty show. It’s no longer just a relationship. Without questioning, those things are important, but more and more as a result of the types of clients with whom I work, folks are beginning to ask for more granulare information, more of a “show-me” type of information. And for several clients that’s becoming a differentiative in relative to retaining a law firm or splitting the business. Jared Correia: That makes a lot of sense. Let’s move onto the next question. What does the data mean? What does that data that you just described specifically mean for law firms using, or wishing to use analytics in their law practices? Bill Sowinski: As I’ve said before, I work with corporations and they’ve sort of got it easy. When we take a look at corporate data, we look at it from the perspective of the corporation. What do you want to accomplish, how do you want to manage your legal books, how do you want to save money. So it’s very self-focused and Patrick can address this better than I can, but one of the complexities I know that law firms have is that they have to keep two sets of books. They have to both understand their corporate clients -or prospective corporate clients, they have to protect their business, and then they have to go out there and they have to seek business. And to do that they need to understand corporations, their growth areas, their needs, their existing law firms and so on. But in addition to that, law firms need to understand their own practices internally. So that’s what I mean by two sets of books. They need to have good data relative to how to grow their business; information outside of their law firm. But they also need to have extraordinarily good information about their law firm, about their individuals, how they handle their cases. And more and more corporate clients are asking that the law firms get more and more specific. Jared Correia: Yeah, that makes a lot of sense; now Patrick? Patrick Fuller: Yeah, I think Bill hit it right on the head and I think there’s one other point that I’ll point to and we talked about it just a second ago about the changing in dynamics. You have a group that is getting decreasing share of a rapidly increasing market and the complexity that creates. But what it also does is it creates an opportunity – especially with analytics because numbers know no ideology; numbers have no inherent ideology. So that level of complexity really presents an opportunity to sell change internally much more effectively. The one thing that everybody listening to this knows is that when you look up risk-averse professions in the dictionary, there’s a picture of a law firm. And that’s something that we’re aware of. It’s a risk averse and change averse profession. And so what this enables us to do, because the numbers are not part of any inherent ideology, is that it’s utilizing the metrics and the analytics and it’s easier at that point to sell change internally. Most people buy with emotion and justify with logic. We’ve all experienced that as consumers. But certain professions – and lawyers are into this very much – tend to buy with logic first before they get emotionally attached. And so that becomes a really intrical part of selling the need to change internally. Because as we’re going to talk about this and Bill sort of hit on already, with how the clients are going back to the law firms and requesting certain amounts of information. The practice of law is still going to be the practice of law but the business of law has changed tremendously over the last 20 years. So that is something that when you start selling change to a risk averse and change averse group, you have to have something that is going to be what you’re going to convince the logical aspect of that with and that is where the analytics come in. Jared Correia: Makes a lot of sense and with analytics being so brand new perhaps there’s an opportunity to set the ideology here. So let’s talk practically; for law firms that want to implement analytics, what’s the preferred strategy? Can you guys sort of lay out a hypothetical road map for implementation potentially including some management systems that would need to be put in place? Patrick Fuller: Yeah, I think the first thing that we have to figure out is what’s the business problem we’re going to try and solve for. And one of the questions I always used to ask with the consultant, when I walk in and begin one of these, is help me understand now what you’re going to say no to. Because if I understand what is absolutely off the table, then that gives me a lot more freedom to be able to put things on the table. And so that’s typically where I starty. Sometimes that means that we need to recognize the need of change and you have to build a case and go back to selling that notion of change internally, but in some cases they’ve already accepted that fact and now it’s really going to be about what are you going to say no to. For me, that’s a fundamental starting point because we can go through all of the applications and Bill just puts them together perfectly in his book. But we can go through all the applications of the legal management model, for example. And if they’re not buying what we’re selling by the end of that, then we’ve wasted a lot of time and a lot of money. So to me that’s the first thing that we have to figure out is how’s it going to be used, what’s their appetite for usage, and what business problems are we trying to solve. Jared Correia: That sounds good. Now, Bill, do you want to add to that? It sounds like process is probably where you would fit in there right? Bill Sowinski: Absolutely. When a law firm approaches a corporation, the metrics portion of it can be important, sometimes it’s not important; but it’s becoming more and more important. And partially it’s because of what I do and how I work with my clients. Just to put a little bit of background, when I work with clients, working with Tymetrix Datacert, we provide them a better management system, and then we also provide them an invoicing system. And when you take a look at the information that you can capture on a promoter basis, you capture all sorts of important information. Jurisdiction, the severity of the matter, all of that sort of information. And then you marry that with how those matters were billed. What law firm billed you, what level propriety billed you, whether receiving partner or junior partner or an associate, what did they bill you, how many hours did they bill you, what sort of things did they bill you for. But the important thing is that is all then combined together in a reporting tool. And so that information that used to be impossible to get is now simply transparent. You can get it literally in a second. And Patrick and I have given presentation after presentation to identify two law firms the sorts of information that their clients can know about them. And all of the lawyers who see that, their eyes just get large. They don’t realize the level of information, the granularity can be an outcome of information that is at the fingertips of the corporations. And as the corporations get more and more sophisticated, they are going to be expecting that there are law firms that are equally as sophisticated. Because all of that information that the corporations have, or virtually all of it, the law firms have. But the law firms are not farming it, they’re not using it, they’re not building as much structure around it as the corporate clients are. And I think it’s mostly because their clients have never demanded it before. But I can assure you that the clients will be demanding it on a go-forward basis. They’re going to want to know. If I give you a hundred thousand document discovery project, what is it going to cost per page. How much is it going to cost; they’re going to want to know that and those sorts of questions aren’t asked now but they will. When Patrick was referring to information and data and so on, it’s collecting the right information, understanding it, being able to use it to answer those sorts of questions you’re going to get more and more frequently and that some folks are getting off of their feet and being on top of it. Because that is now, and it’s going to be, more and more differentiative. Jared Correia: Yeah it makes sense. This will all be solved, by the way, right? When corporations are allowed to own law firms? Well, I guess that’s a topic for another day, right? Patrick Fuller: There’s one point that Bill brought up I want to hit on real quick that I think is really important and that is Bill talked about the eyes wide open and how the pupils get real big when they look at information. And the power of that is in the aggregation. Because when we take something that is by itself, looking at it in a vacuum, you wouldn’t think twice about it, but you look at it through the prism of a lot of aggregated data, and you realize the volume that’s associated with it. And so it could be something that’s attempted in an hour. Or it could be one type of matter or so-and-so’s doing a certain amount of work with this firm or the number of relationships that we have a certain company, and it’s like oh, we know one person. But we start looking at all this data and we start aggregating it together, and all of a sudden you start to see some trends that could be really disturbing. And I look in it a lot, for better or worse, to hidden calories. You don’t think much about that 25 calories, but if you have 100 different pieces of that during the holidays, suddenly you’re approaching 2,500 to 3,000 calories, and that results in a pound of weight. And that’s something that we start to see a lot of with law firm clients and corporate clients alike, that when they look at the data that’s been aggregated over a period of time, sliced and diced and littled down, even into consumable pieces, it’s still eye-opening to them because now they’re looking at it differently than they would with just one piece of information on its own. Jared Correia: Yeah, absolutely; you’ve convinced me, I put down the Snickers bar and we’re going to take up this conversation after the break. When we come back we’re going to have more on making the most of analytics in the legal field with Patrick Fuller and Bill Sowinski. Jared Correia: This is normally the space in our show where we offer words from our sponsors. This potentially represents a unique opportunity for you. 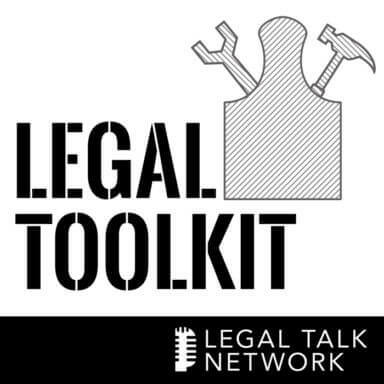 The Legal Toolkit is seeking sponsors. You can hear your advertisement right here, what more could you ask for? If you’re interested, contact the team at Legal Talk Network at [email protected]. Jared Correia: Alright, welcome back. We’re joined today by Patrick Fuller and Bill Sowinski and we’re talking about the application of analytics in the legal field. By the way, did I tell you guys I’m wearing a cheesehead when I’m doing this podcast? God’s honest truth. Two Wisconsin natives and one wannabe Wisconsin native. Last we left off, we were discussing a model that law firms might apply to implement analytics in their law firms. At least with respect to fees and revenue, but I think we got beyond that as well a little bit. So I guess that the key question in that is how would law firms benefit from the adoption of such a model? Bill Sowinski: Patrick and I talked about this often. The way that we started to look at it is that metrics and analytics are essential, and it will become more and more essential for law firms. Both an offensive tool, securing additional business, but also as a defensive tool. Making certain that when somebody asks you why should I hire you as opposed to any of the other 20 law firms within the skyscrapers in downtown Manhattan. It’s just not good enough anymore, or in some instances it’s not good enough anymore; to say I’ve better quality, better cost, better service, better speed, better innovation. Those are all anecdotal stories. Everybody’s got good stories. So law firms should begin to appreciate that utilizing metrics provides them a differentiator. To not only to present their case more effectively to a potential corporate client, but internally. If they capture the correct information, if they know how historically they’ve staffed cases, what certain tasks costs, what level of resource can be most cost-effective just internally and what sort of their sideline officers might be able to perform some of the services that are necessary for matters. If they can analyze and generate that information quickly and with a business intelligence tool, with good matter management information, good invoice information, that they capture. If they can analyze it quickly, they put themselves in a position to be able to address requests and opportunities very quickly knowing that there is profit margin and acceptable profit margin there. Especially relative to higher fees or if you’re competing with another law firm. If you know what’s profitable, you know how to structure your proposition. But you can only do that with good information. Jared Correia: So metrics as a differentiator, I like that. Let’s move on to talking about some technology tools here. What technology tools are available to law firms seeking to apply analytics and how can law firms best use those tools in practice? Jared Correia: It is now. Bill Sowinski: Desiloing some of the functions inside their firms into where – yeah, well it is now, we’ve just coined it on this podcast, which is great. But what they’re doing is they’re taking that experience and they’re utilizing it with the financial market data that’s provided by Datacert|Tymetrix Legal Analytics or by the market-based intelligence that they’re pulling from a Thomson or a Lexus or a Bloomberg or they’re pulling from Capital IQ or whatever it might be. They’re getting this data, they’re marrying it with their own experience and they’re able to say okay, where do we want to attack, where do we have a strength that our competitors don’t and how can we best make money on this engagement by putting the right team together that’s going to be profitable for us and beneficial to the clients. Jared Correia: Pretty good, Bill. I mean that was really an unfair question but I think you answered it pretty well in the truncated space of time. And we have analogies among the podcast which is always good. So I think they say data abhors a silo, is that right? I think I’ve heard that somewhere before. So, I’ve got one more question for you guys, talking about firm size. Most of what we talked about so far as Am Law 200 and big law firms. Let me ask you this: data’s out there, even for small and solo law firms. Is there a realistic model that those firms could adopt? Not to achieve the same ends necessarily that the big firms do, but to utilize data in a more effective way? Jared Correia: How’s that for a segway, Bill? Bill Sowinski: We talked before about law firms, I use the inactual term using two sets of books. One is knowledge about themselves and then the second is the ability to acquire information about the outside world and that’s one of the things that Patrick talked a lot about. There’s no cost area to a small firm capturing information about itself. And there’s all sorts of matter management systems and invoicing systems. All that requires is just some planning and some discipline and data capture; and so you can generate all sorts of information. So you had the perfect talk line, and it’s not cost prohibited. Some of them gets a little bit tougher, and it is. Where do you identify your areas of opportunity and can you bring in some outside information. Well, one of the advantages smaller law firms have is they’re very much relationship-driven, so you want to leverage that and to the extent that you need some additional outside information; you strictly have to do a cross benefit analysis. If a smaller firm generates two or three additional clients a year, that’s huge to those firms. It’s not to a large firm, but it is to those folks. So unfortunately, the scale that you’re looking at also helps reduce your cost. But the most important thing, and the thing that more and more clients are looking for, is law firms who understand their cost structure. And you, as a law firm, putting yourself in a position to understand how you can price out business to be profitable. And there’s no barrier to a small firm to be able to do that. Jared Correia: Yeah, great points, Bill, and that’s a good way to end the show today, I believe. So we did it! We talked about data analytics for about a half an hour, nobody nodded off – at least to my knowledge, and so that must mean that we’ve reached the end of this episode of Legal Toolkit. Keep in mind that you can check out any of our shows at any time on LegalTalkNetwork.com. So thank you both very much, Patrick Fuller and Bill Sowinski, for taking the time to address this topic with me today. Jared Correia: I enjoyed talking to you guys as well. Patrick Fuller: It was a pleasure, thank you very much. Jared Correia: Can you tell our listeners how they can find out more about Datacert|Tymetrix? Patrick Fuller: For the Tymetrix Legal Analytics you can go on the web to Tymetrix.com and go under legal analytics and you’ll see information about decision support services, which is Bill’s department and legal analytics which is mine. Bill Sowinski: There are all sorts of links and publications that I think folks might find useful and all sorts of contact information. Jared Correia: That’s sort of what websites are for, right? It’s 2015 now, go to the website, check it out. These sale pitches become so much easier over time, right? Thank you both again for appearing on the show today I really thought it was a great discussion and thanks everybody out there for listening today.